By Travis - Argentina - 25 Mar/03 - Viewed 1847 times. Rising very early on Wednesday morning, only to wait nearly 30 minutes for the hostal staff to arrive and prepare our breakfast, we made it to the Punta Arenas bus station with less than five minutes to spare before our bus departed to Ushuaia. By this point in our trip, there were a few familiar faces on the bus, in particular one young lady from Ireland who we have come across in three other places and gotten to know fairly well. In this part of the world, the towns are small enough and the points of interest well defined that we share common itineraries and experiences with most of the travelers we meet. With the exception of getting off the bus to take a ferry across the Straight of Magellan at Punta Delgado, the twelve-hour bus ride to Ushuaia on the southern coast of Tierra del Fuego seemed like a re-run of our previous long-range road trips. At the start of our trip, we had not planned to visit Ushuaia (or Tierra del Fuego at all), but had heard lots of good things about the area from people we�d met along the way. In addition, our boat to Puerto Montt won�t leave Puerto Natales until March 28, so we needed something to do for a week. This has given us a very relaxed schedule of activities, and we have enjoyed staying in one place for several days. We are staying in a small, family-run and occupied guest house by the name of Los Troncos; they have been very friendly and are a good resource for things to do while we are here. Abi quickly made friends with the little house dog, Rocco. After spending the first day catching up on e-mail, grocery shopping, buying tickets back to Punta Arenas (with only one bus per day, they tend to fill up early), and making a tentative schedule of activities, we headed to Tierra del Fuego N.P. on Friday. The sky was overcast, but it was great weather for hiking if not ideal for photography. On our way to the trailhead, we watched the tourist train pass by�it�s an old steam locomotive that runs on narrow-gauge tracks, and was used years ago to transport prisoners from the Ushuaia penal colony into the forest to harvest timber for fuel and building material. 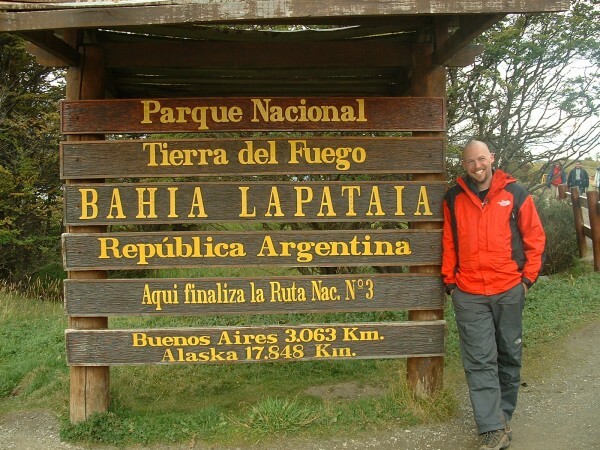 Our day hike through the park was about 20 km, starting out in the wooded foothills of the mountains, then along the coast of the Beagle Channel and to the western end of Lapataia Bay. Other than a single red fox (who had learned to beg food from tourists�we denied him) and some rabbits, the only animals we saw were birds: falcons, two varieties of ducks, gulls, something that looked like a gigantic quail, and smaller woodland birds. We came across a large beaver pond, with half of the surrounding trees chewed in half about a foot up from the ground, but no beavers. We had a nice time, but by the end of the day we were bushed. As I had promised Abi at the start of the day, we went out for a nice dinner that night and she was overjoyed with her crab, for which the area is widely known. Saturday we rolled out of bed a little later than usual and were greeted by a clear blue sky, a Patagonian meteorological phenomenon, at least in our experience. Although we had planned to take the boat tour of the Beagle Channel later in the week (and spread out the highlights over the course of our stay), the weather was irresistible. The excursion was to start at 3:00 PM, so we spent a while going from one hotel and bar to another to find a place to watch the Oscars on Sunday night. After encountering a number of blank stares and shrugged shoulders, a young, English-speaking concierge knew exactly what we wanted. Once he found out we were from St. Louis he talked about the Rams and Mark McGwire�he was very well equipped to take care of visitors from the U.S.
We toured the Channel on The Barracuda, which we were told was the first vessel in Ushuaia in the tourist trade. It was a little frumpier than some of the newer excursion ships, but it had a very shallow draft and an able Captain, and it seemed that we were able to get much closer to the various islands than some of the other tours. We started the tour on the open-air top deck, but our perfect day was tainted by a few clouds coming over the mountains to the north and west and into the bay, and we had to move to an enclosed sitting area at the stern of the main deck to stay warm. There were a couple of maps on the front wall of this sitting area, and the main one of interest was mounted somewhat behind and to the right of a statue of a nubile, young lady posing in not a stitch of clothing. With the pedestal on which she stood, she rose to a total height of about six feet. Her positioning caused the passengers who were interested in following our route to peer at the map mounted behind her by placing their head between her well-proportioned torso and her outstretched left arm, and steadying themselves by reaching across her midriff to place a hand on her charming little right hip. Watching this was the highlight of the voyage for me. But seriously, the scenery on the boat trip was wonderful. We had a great view of the city of Ushuaia tucked between the base of the Fuegan Andes and the Beagle Channel. Our first destination was a rocky island inhabited by hundreds of ducks, black on their backs and wings and white on their bellies, so they looked a lot like penguins when standing around on the land. We learned that they migrate to this area each summer, and choose a different island in the Channel each year to make their home. The next stop was an island where a colony of fur seals were sunning themselves; they may look cute, but they are better viewed from a distance or at least up-wind to avoid the aroma. We took a lap around another outcropping with a lighthouse before heading back to port. Saturday night we went to the movies to see Atrapame, Si Puedes (Catch Me If You Can), which was in English with Spanish subtitles. As is our custom in the U.S., we stopped at a little kiosko beforehand to get some things to munch on during the movie. We were surprised to see that the prices at the concession stand at the cine were the same as (or in some cases below) the cost at the regular store, and this was my first culture shock moment of the trip. We had already seen this show on Christmas night with my mom back in the States, so it was funny to walk out of the theater and still be at the tip of South America. Sunday we hung out at Los Troncos, watching BBC World (to see what is happening in Iraq) and a very bad Burt Reynolds movie from 1978(?) as that was the only thing on in English. That night we went back to the bar we found a couple of days earlier to watch the Oscars, and were trumped by another couple watching a futbol match (I think the waiters also wanted that channel as well). After checking in a couple other spots, we found a restaurant that agreed to let us watch it, and it wrapped up at 2:00 AM our time. We tried to get out on Monday for a day hike, but the weather didn't cooperate. We took a walk to Bridal Veil Falls (about 10 km away), which didn't quite meet our expectations but it was nice to get outside after being cooped up for a couple days. Thankfully, we were able to hitch a ride back to town, as the waterfall was a little futher away than we had originally been told. We leave at 5:30 tomorrow morning to return to Puerto Natales and catch the ferry (three days) to Puerto Montt.